This weeks Photo Hunters theme is "Reflection." 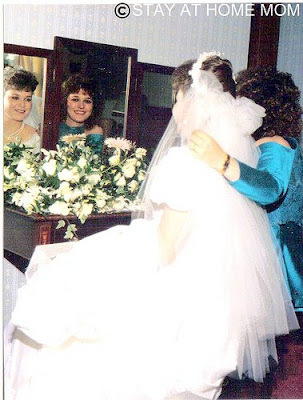 Here is a picture of my sister and I on my wedding day. The photographer had my sister and I look in the mirror on my mother's vanity. Here is our "reflections" as we look into the mirror. That's a beautiful picture Sue! How sweet that the reflection is of your sister and you. Did the photographer do you and you mom too? I have one of my mom and me. I think that's a pretty standard pose, but I really like how my mom looks in my photo. Thanks for sharing and visiting my blog too. What memorable moment between you and your sister. You had a good photographer - what a wonderful photo! I see nothing but happiness in the "reflection"! Wishing you and your family a very Happy Thanksgiving - a time for "reflection" - we have so many blessings!